This is a drawing that was inspired by a peculiar gesture. 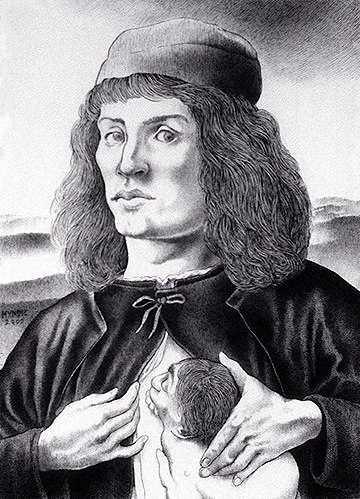 The inspiration source is a Sandro Botticelli portrait of an unknown man clasping a portrait medallion of one of the Medici's to his chest — which I presume was a gift from his patron. To my eye it's a rather inelegant position, which I have always thought looked more like the man is clutching a wound or tumor rather than proudly displaying a gift or expressing his loyalty (“Yeah, doc, it hurts right about here...”). So, the next logical step was to elucidate his malady. This fellow's condition is rather similar to that of James Poro, who was exhibiting himself and his twin in London at the turn of the 18th century.